Dr. Sabrina Shah-Desai, MS, FRCS is a leading international aesthetic and reconstructive oculoplastic surgeon. Our cadaver-based courses teach multi-disciplinary injectable techniques developed by world leaders in their fields. Learn filler techniques from renowned international surgeons. Welcome to OFAA – A unique non-surgical skills development academy, offering hands-on customized eye and face anatomy education and training. 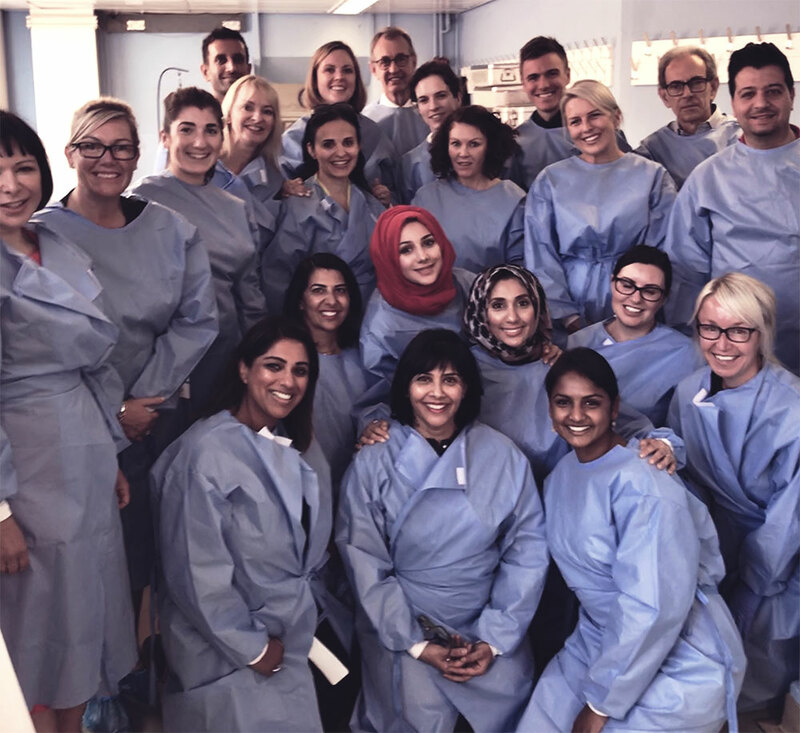 OFAA have a passion for safety, knowledge, and expertise at the core of their offering for all attending delegates and OFAA courses are available to both UK and International non-surgical and surgical aesthetic practitioners. OFAA courses are available to both UK and International non-surgical and surgical aesthetic practitioners. It is important that you choose an appropriate course once you have set your foundations, as cadaver courses are expensive. We get a lot of delegates coming on our courses that have been on one, two or even three previous cadaver courses before finally coming to us. The main reason is a lack of clarity of relevant facial anatomy and practise of various injection techniques, in a safe manner for practitioner. Whether, your skill set is at the early roots of your aesthetic non-surgical career or whether you are an experienced health care professional looking to advance and refine your technique and skills set, we understand the common concerns that you face and try to provide you with the most current & relevant evidence based literature update and latest anatomical findings at every course. We offer three separate one day cadaver courses, so as to consolidate your understanding and allow sufficient time to practise different injection techniques. OFAA aims to train clinicians in the challenging and highly subspecialist area of peri-orbital, nasal and full facial non-surgical injectable treatments, at state of the art training labs across UK. After completing your training with us, you will be confident in understanding facial anatomy, safe injection planes & techniques, and the management of complications as our exclusive courses utilize fresh frozen cadavers. OFAA was founded by Mrs. Sabrina Shah-Desai (MS, FRCS), an Aesthetic and Reconstructive OculoPlastic Surgeon, with more than a decade of experience in aesthetics, and a career spanning over 20 years collectively in the specialty, Mrs. Shah-Desai is a highly sought after industry trainer working globally to educate professionals. To find out more about OFAA courses, locations and OFAA trainers, please do browse our website for further information, you can also keep up to date with our latest news and social media activity by connecting with us. Our team is dedicated to ensuring we respond to your enquiry within 24 hours of contact, please do not hesitate to ask us any question, we will only be too pleased to help answer your enquiry on facial aesthetic training. Thank you for visiting OFAA. Note: OFAA only accepts Doctors, Dentists and Independent Nurse Prescribers.OFAA accepts international medical professionals, on an individual basis, via email request with relevant professional regulatory registration details.